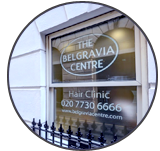 The kind of hair loss caused by chemotherapy treatment is widely reported, but what surprises many is that when locks do grow back (as they usually do) they are often rather different to those that a patient used to know and love. Frequently, hair comes back curly, which can be extremely surprising when someone has had straight hair all their life. Equally bewildering is the fact that new growth is quite often darker, too. Experts are not 100 per cent sure why changes in texture happen, though a darkening may be explained by the chemotherapy process temporarily causing hair to grow more slowly, thus exposing it to more pigment. British charity Breast Cancer Care has a full page of advice about hair loss from chemotherapy – known as anagen effluvium – on its website, and notes that once-curly hair can become straighter, too. Changes in texture, it notes, can be permanent in some cases, and explains that this can be difficult to deal with. “You may feel it is another change to your appearance you need to cope with, especially if you’re not able to treat or style your hair in the way you always have done,” writes the charity. Treat new-growing hair with care, as it will be delicate and can break easily. Talk to your hairdresser about how best to style it while it is regrowing. Wait until hair is longer and the hair and scalp are in good condition before applying colours or other chemical treatments. Henna or vegetable-based dies can be gentler on the hair and scalp. Make sure that you do a skin-test on any colourant you plan on using on your hair, even if it’s one you were happy with before cancer treatment. This is to make sure that you don’t react to it and the end result is still the colour you want. There is little doubt that losing hair as a result of chemotherapy treatment can be distressing, and it is for this very reason that several companies around the world have developed scalp-chilling devices calls cold caps. These can be worn on the head immediately before, during and after chemotherapy, and by cooling the scalp they reduce blood supply to the hair follicles, meaning that their exposure to cancer drugs is minimised. Cold caps don’t work in every case, nor are they suitable for all types of treatment, but data provided by the companies that make them, including UK firm Paxman, shows that they have helped people to keep their hair on numerous occasions. Can Cancer Survivors Use Hair Loss Treatment?